JBoss World 2009 is just under 3 weeks away and it’s still not too late to register. GEICO CIO Jess Reed will be one of the keynotes this year underlining that JBoss World is a great place to come and learn how other organizations just like you have saved money and improved performance and stability by moving to JBoss and Red Hat. You can even save money ($400) on saving money by registering before the event. I’ll be at Red Hat Summit / JBoss World all week and have a couple of sessions talking about JBoss Enterprise App. Platform both present and future. If you’re around and want to chat – get in touch. Here’s an interview I did for DZone a while back about Red Hat’s involvement with OpenJDK. I’m still amazed by the diversity of wildlife we see in North Carolina (and previously in California). I seem to remember very little about English wildlife other than Hedgehogs, Crows and the occasional Fox and numerous brown and grey bugs. Contrast that two these two colorful critters spotted in the last few days. 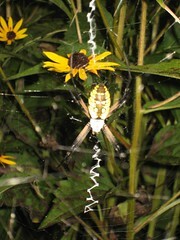 The first are a pair (male and female) of Black and Yellow Garden Spiders – named for their Black and Yellowness and their location in the Garden no doubt. 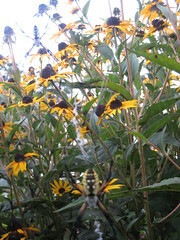 The pictures are a bit crap as I had to poke my arm through the undergrowth and click. The next encounter was a bit further a-field – North Topsail Beach to precise. 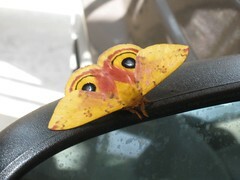 This stunning Yellow Io Moth wanted to hitch a ride home with us. A bit of prodding made her open her wings before we put her safely on the ground.